Welcome to St. Symeon Orthodox Church. We hope you will stay and visit with us after the service so we can welcome you more personally. Because Orthodox Christianity is unfamiliar to many people, we have prepared this FAQ page to help you pray with us. First, a word about communion. Communion is the most sacred of all trusts that Christ left for His church. Every priest is reminded at his ordination that he will answer for how well he guarded this most wonderful of all mysteries. For us, the Eucharist is not a symbolic act, but rather one that connects us deeply and spiritual with Christ Himself. To partake of communion is in essence affirming your belief in the Orthodox Church and all She stands for. Communion is for those Orthodox who have fasted properly and been to Confession recently. Please try to introduce yourself to Fr. Alexander ahead of time. Otherwise, be prepared to provide answers about your jurisdiction, your bishop and the last time you went to Confession. We do not offer communion to those outside the Orthodox Church. You are more than welcome to stay for the entire service, but we do ask to respect this most Blessed Gift. The Orthodox Church is the Church which existed continuously in the Middle East and Greece from the time of the Apostles, and is the Faith of the majority of the Christians in Greece, Russian, Romania, Bulgaria and Serbia. With the exception of Rome, the local churches mentioned in the New Testament, which existed continuously until today (i.e. Corinth, Thessaloniki, Antioch, etc. ), are Orthodox churches. The Orthodox Church in America, or OCA, is the successor of the first mission to North America begun by St. Herman and other Russian monks in Alaska in 1794. The Church has been in America since that time and was granted autocephalous (self-governing) status by the Russian Orthodox Church in 1970. At the time we took the name “Orthodox Church in America,” because our mission is to be a Church for all peoples in America, and not to any particular ethnic group. We are in full communion with the Greek Orthodox Church and the other Orthodox Churches throughout the whole world. 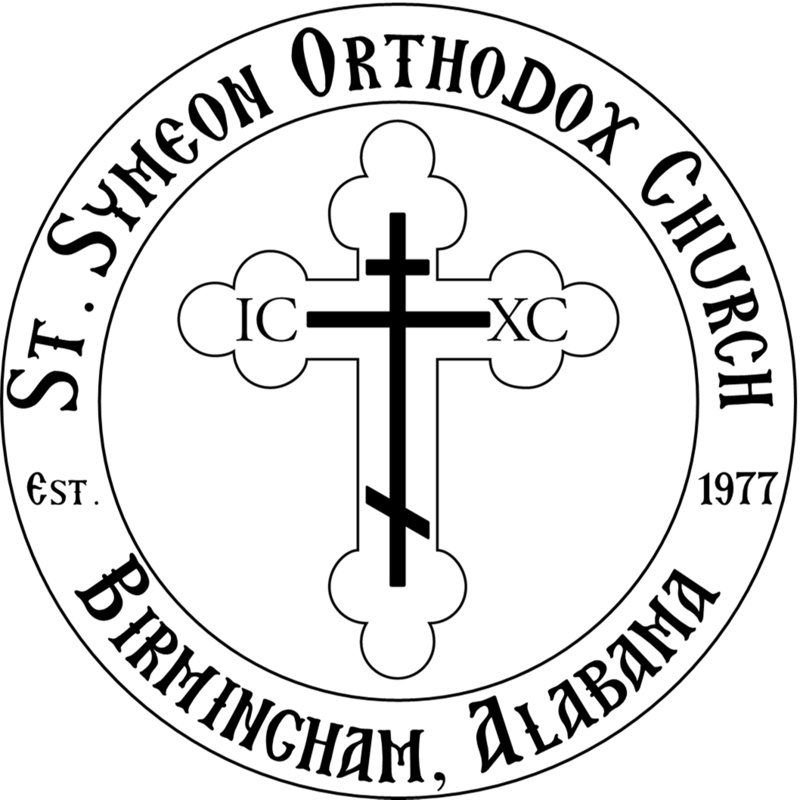 St. Symeon Orthodox Church was founded in Birmingham in 1977. The present church was built in 2014. While we do have a few “cradle” Orthodox of Russian, Romanian, Greek, Arabic, and Serbian backgrounds, the majority are converts to the faith with no particular ethnic ties. How do the Orthodox worship? The Saturday evening service is called Great Vespers. The Sunday morning service is called the Divine Liturgy. Including the sermon, it lasts about two hours. Services during the week services are usually Vespers as well, sometimes with slight variations. Is there a book to help me along with the service? Yes, we do have books for the services. They are next to the candle stand. For most people, however, trying to follow along in a book is distracting. You may miss out on the flow of the services. Reading the text just isn’t the same as experiencing the worship going on around you. So where are the pews? Standing, kneeling, and prostrating are Biblical postures for prayer and worship. We traditionally stand during Divine Liturgy. This takes some getting used to. Feel free to sit on the side pews as much as you need. There will be a few times when you may be motioned or asked to move toward the center as our priest and/or deacon come around with the censor. Just remember to relax and try to bring comfortable shoes! What about a nursery for the kids? Our children are our greatest gift from God. We do not have a nursery because we want them to benefit fully from the grace that comes from our services. This can be stressful for those visiting for the first time, but don’t worry, they do learn to settle down after time. Feel free to take them back to the vestibule or to the cry room if they are restless. We’ve all had to do it from one time to time, so don’t think you’re the first or that your going to be run out. Everyone that has a child (and most in our parish do) understand and feel what you are going through! Theotokos (means “Mother of God”) is the title for the Virgin Mary designated by 3rd Ecumenical Council of the Church in 431 AD. Orthodox love and honor (but do not worship) her because of her love for her Son and Lord Jesus Christ. The honor given to her also expresses our faith that Jesus Christ is truly human, born of a woman, as we are, yet has always been the Son of God, so we call His mother the “Mother of God” to identify her Son’s divinity. Icons are paintings of Christ, His mother and the Saints. They must be painted according to a strict tradition because they are ways the Faith is handed down and taught. They are kissed, venerated, but not worshiped, as a sign of our belief that Christ God took a physical body, became part of our physical world so we could know Him. Other human beings who unite their lives with Christ become holy and the image of God shines through them. We honor them as friends of God. Why are standard prayers used? Standard prayers and hymns (not made-up prayers) are offered because these are inspired by the Holy Spirit from the earliest of times of the Church. They contain the accumulated insights of many centuries of Christians, and are packed with Biblical quotations. They are repetitive because that way these holy thoughts become rooted in our hearts and minds. They are chanted and sung rather that spoken because heavenly worship is filled with song. Also, it moves our attention from the personality of the reader, so we focus on the Word. What else should I expect to see in an Orthodox service? Hymns of the day - on Sundays especially of the Resurrection, and the hymn "Holy God"
Eucharistic Prayer – We “lift up our hearts” to join the heavenly choir and angels singing “Holy, Holy, Holy” and offering thanksgiving (Eucharist) to God for all His works. We especially remember Christ’s saving works, and asking the Holy Spirit to transform the Gifts into the Mystery of Christ’s Body and Blood. This concludes with the Lord’s Prayer. Holy Communion – Orthodox Christians who are prepared by Confession and fasting receive the Holy Gifts as an essential encounter of union with Jesus Christ. Our Children receive because God’s work in us is not limited to what we understand. Vespers The normal Saturday evening service is called Great Vespers and lasts for about 45 minutes. It is followed by a 10 minute service of Preparation of Communion. Confession follows at the end the service. Vespers is a service of chanting and singing of Psalms and hymns celebrating the themes of Creation and Resurrection as the eve to the Lord’s Day. Litiya is a short service that is done following Vespers served for a feast. We ask for God’s blessings for our parish, each other, our city, country, and the world. We pray for peaceful times for ourselves and those that live around us. Bread, wine and oil are blessed (this is NOT to be confused with the Eucharist). We are anointed with the oil and given a piece of the bread dipped in the wine. Visitors are welcomed to participate. The Akathist is a collection of hymns and prayers, usually for the Mother of God or one of the saints.